Dhammika Fernando, a versatile, dynamic and experienced human resource management professional was unanimously elected as the President of the IPM Sri Lanka Executive Council at the Annual General Meeting held on Saturday 28 July. Dhammika currently functions as the Executive General Manager of Tropical Findings Ltd., a Japanese multinational company operating in the Katunayake Free Trade Zone. He is a past Chairman of the FTZMA (Free Trade Zones Manufacturers Association) having held the position for five consecutive years until 2015 and a member of the National Labour Advisory Council of the Ministry of Labour and also a member of the National Wages Board for the Apparel Trade. A Corporate Member of IPM since 2002, Dhammika Fernando was first elected to the Governing Council of IPM Sri Lanka in 2007 and has since served in many capacities throughout his illustrious career in the Council as the Chairman Young Members’ Forum (YMF), Hony. Secretary of IPM in 2009/10 and Hony. Vice President from 2010 to 2012. During his tenure, he chaired the organising committee of the IPM International HR Conference in 2012 which was one of the most successful conferences of IPM at the time. He also represented IPM at the CIPD Conference in UK, Hong Kong International HR Conference and Bangladesh HR Conference organised by the Bangladesh Society of Human Resource Management. He was also awarded the prestigious ‘Global HR Excellence – HR Leadership Award’ at the Asia Pacific HRD Congress in 2010. “I consider it very much a privilege to lead and provide guidance to IPM Sri Lanka in our journey to be the Asia Pacific region’s leader in human resource management. Our vision is to be a world class professional body in human resource management is shared by one and all, starting from the dynamic, committed executive council and IPM members to the lecturers of the business school and the staff of the secretariat,” said IPM Sri Lanka President Dhammika Fernando. Dhammika’s quest to strive towards achieving their ambitious plans is already underway with IPM Sri Lanka winning the hosting rights to the prestigious World HR Congress 2020 under his guidance as the Co-Chairman of the IPM External Affairs Sub-committee. Currently, he is an IPM nominated Vice President of the OPA Sri Lanka. 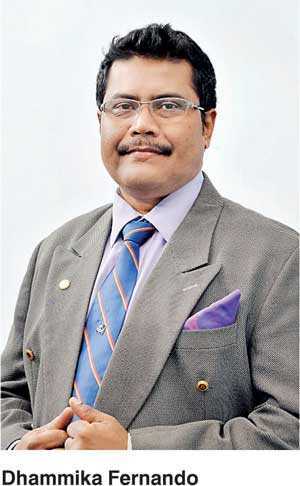 He is the Past Chairman of ‘The Management Club’ Negombo, President of the Lions Club of Katunayake Seeduwa, Vice President of Alumni of his Alma Mater and a member of the Alumni of University of Moratuwa. Dhammika completed his school education at Maris Stella College Negombo, academic education at the University of Moratuwa in the field of Electronics and Telecommunication Engineering, professional education at IPM Sri Lanka (NDHRM) and postgraduate qualification from the Open University. He also holds an MBA, a two-year research degree from the Open University of Sri Lanka, specialising in HR. Before joining the IPM Council, Dhammika served in several IPM Standing Committees including the first ever marketing committee. He was also instrumental as co-founder in introducing ‘The Great HR Debate’ as a novel feature to the agenda of the IPM National Human Resource Conference. He also chaired IPM’s Audit Committee and the Finance and Admin Committee.